Have you ever visited a doctor’s office and had the staff treat you like you were a number? They didn’t even recognize you when you came in. You filled out a check-in sheet where everyone else could see your information. You waited in an impersonal area — for a long time. Even the doctor, who has seen you before, told you “It’s nice to meet you.” You likely felt forgettable, unimportant, and that your time wasn’t valuable. Contrast the above scenario with walking into your doctor’s office to have the receptionist’s eyes light up when you enter. She has your chart in hand and greets you by name, remembering a small detail about you. The waiting room is cozy, helping you feel relaxed and comfortable. Promptly, you’re called back to the exam room, which is also warm and welcoming. Your doctor calls you by name and treats you like a VIP. ● Recognition: They recognize what needs to be done and they do it. ● Trust: Their actions build trust among their peers and patients. ● Communication: They communicate openly and honestly. value high-quality and compassionate care? range, you are losing money. Are you ready to dramatically increase your medical facility’s patient satisfaction, employee retention, and profits? Guess what? You’ll also reduce the number of readmissions. The Centers of Medicare and Medicaid Services (CMS) report spending $17.8 billion a year on avoidable readmissions. You must improve your employees’ engagement. mistakes and stay with their company longer. variance in engagement (source: Gallup 2014). revenue, lower costs, and increased profits. Evaluation of your completed questionnaire about your facilities current state of patient satisfaction. On-site visit to capture “first impressions” of your facility. Suggestions on how to make your facility more welcoming. Connection with each team members’ “Why” they’re in this field. Benchmark comparison and goal setting. Use of StrengthFinders© evaluation to help each team member recognize his/her strengths. Teaching you and your team how to touch the hearts of your patients by showing ways to demonstrate that you care about them. 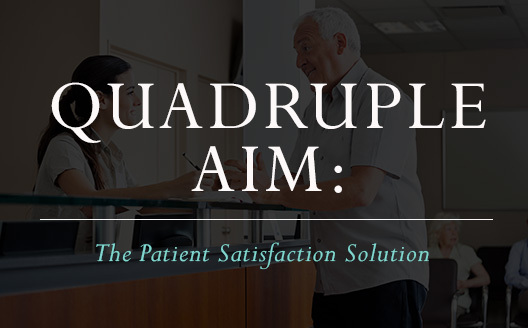 Quadruple Aim Training for you, your administrative staff, and medical staff. It’s mandatory that everyone participate.